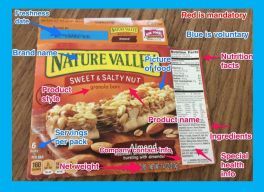 I’ve introduced this lesson by passing out random food labels to students and asking them to identify all of the important information they see on the label. We discuss all contributions and talk about the fact that some of the information needs to be there and some information is optional. Define the terms mandatory and voluntary and provide notes of examples of food label information that applies to both categories. Students write this information on their notes sheet for use in the SKITCH assignment. After going over all of this information if the items, students see how many exist on their food labels used in the intro activity. Finally, students are assigned the SKITCH Label Project. After downloading the app, students take a picture of a food label. I folded a variety of granola bar boxes so a front and side panel were showing. Students used their notes to label the information showing on their photo using the SKITCH tools. I stress that they are only identifying the info, both mandatory and voluntary, that is visible on their label photo. After students have annotated their label and are satisfied they labeled everything correctly, they share their finished product with me via Google Classroom.